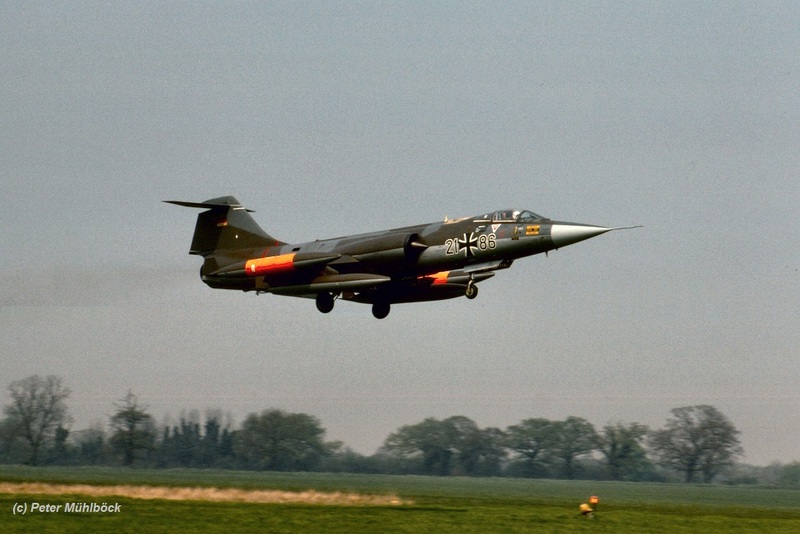 This month German Air Force JBG33 based at Buchel, flying the F-104G exchanged with Royal Air Force 208 Squadron based at Honington flying the Buccaneer S.2B. It is unknown if it was a 1 or 2 way exchange but at least the Germans flew to the UK. 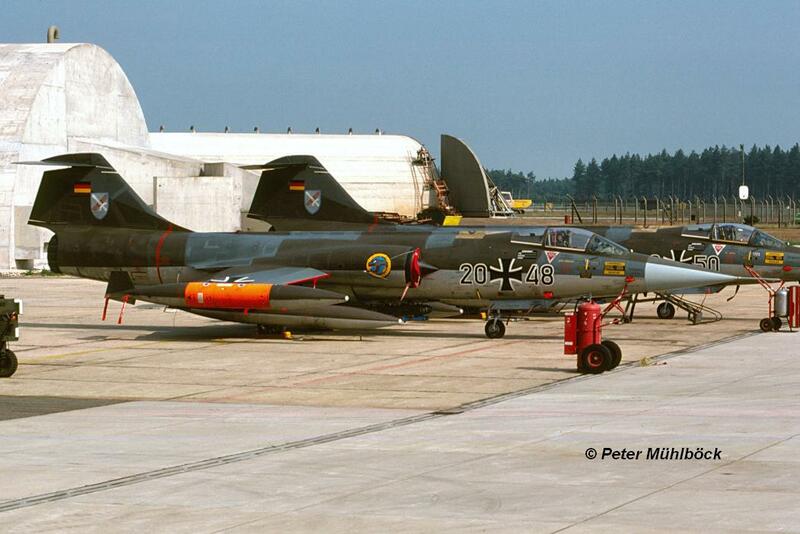 At least seen were F-104G 25+33 (JBG33blue), 21+86 (without badges) and TF-104G 28+32. Beneath photos taken by Peter Mühlböck at Honington during the exchange. 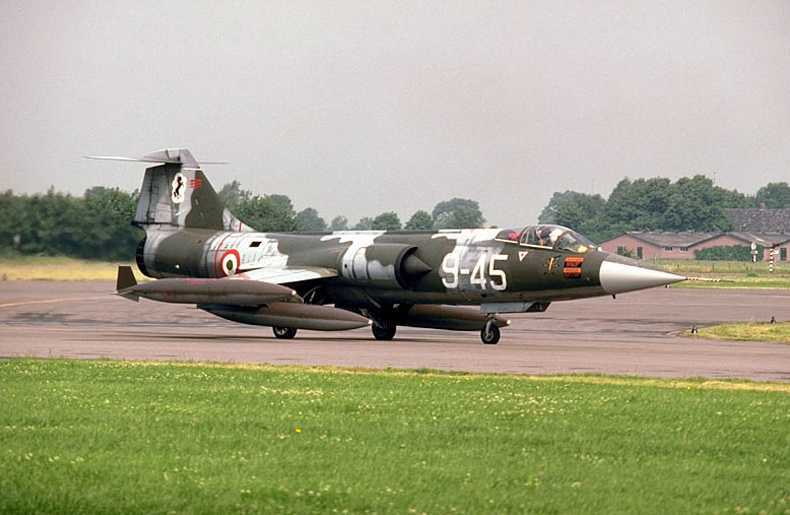 This year Danish Air Force 726 Eskadrille based at Aalborg, flying the F-104G and CF-104 exchanged with RAF 41 Squadron based at RAF Coltishall, flying the Jaguar GR.1. It is unknown if it was a 2 way shift exchange. At least the Jaguars were seen flying around over Denmark and in May Danish Starfighters were seen at Coltishall. 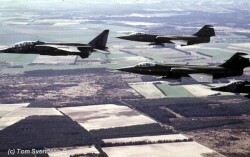 Photos beneath show two Jaguars and two Starfighters in formation over Danish landscape. 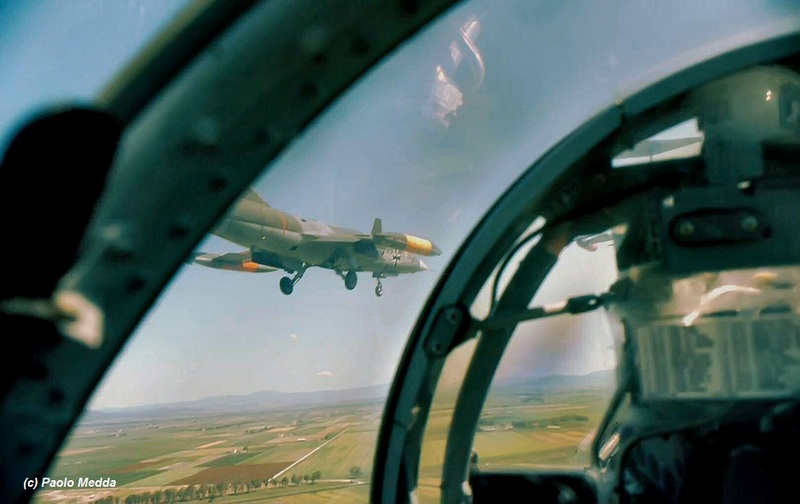 This month a squadron exchange took place between Italian Air Force 9 Gruppo from Grosseto, flying the F-104S, with the German Air Force WS10 (1st Staffel) based at Jever AB, flying the F and TF-104G. It was probably a 2 way exchange. 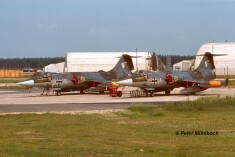 At least the Germans were seen at Grosseto including F-104G 24+90 and TF-104G 27+06. 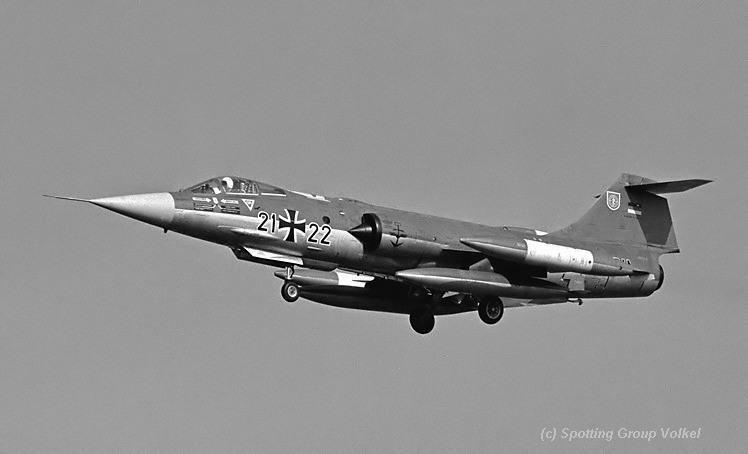 One existing photo of MM6726 code 4-3 at Jever in 1982 (taken by Peter Doll and seen beneath) could suggest that indeed it was a two way exchange although that F-104S just could have made a visit to discuss the exchange at Jever. Beneath also two other photos which were taken over the Grosseto area thanks to Paolo Medda. This month a squadron exchange took place between Turkish Air Force 6 AJU based at Bandirma AB, Turkey, flying the F-104G or F-5, with the Dutch Air Force 316 Squadron, flying the NF-5, based at Gilze-Rijen AB. It was a one-way exchange. Only a number of NF-5 aircraft flew to Turkey. We are still looking for confirmation if the squadron at Bandirma was flying the F-5 or the F-104G. Who knows more? 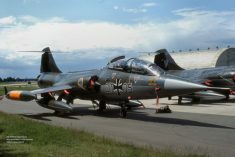 This month Canadian Air Force 441 Squadron, based at Baden-Sollingen, flying the CF-104, had a Squadron exchange with Royal Air Force 54 Squadron, flying the Jaguar GR.1, based at Coltishall. 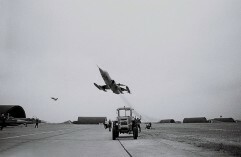 It is unknown if it was a 1 or 2-way exchange but at least a number of CF-104 came to Britain with eleven (!!!) CF-104’s. This period a squadron exchange took place between USAFE 78 TFS/81 TFW “cobra” based at Woodbridge AFB, flying the A-10, with the German Air Force JBG31 (2nd Staffel) based at Norvenich AB. It was a shifted 2 way exchange. 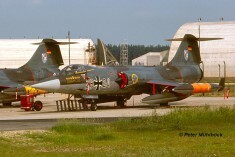 During the first phase six A-10 aircraft came over to Germany from 8 till 16 June. This later 2nd phase six Starfighters came to the UK. The German Starfighters were all been decorated with specific snake badges (78 TFS). 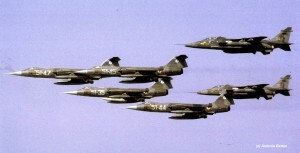 Participating aircraft were F-104s 20+39, 20+48, 20+50, 20+75 and 26+24. Also TF-104G 27+35 was seen. In April 1982 the 20+75 was already seen with this badge so likely this aircraft flew to Woodbridge during the pre-exchange. Beneath five photos which we received from Peter Mühlböck showing F-104Gs 20+48, 20+50, 20+75 and 26+24 at the airbase from various angles. Note the wonderful applied snake badges. Final photo of TF-104G 27+35 was taken by Helmut Baumann at Woodbridge, also this aircraft was zapped. The Dutch Air Force 314 Squadron based at Eindhoven AFB, flying the NF-5A exchanged this period with Italian Air Force 10 Gruppo from Grazzanise AB. It was a two-way exchange. There was a pre-visit on April 5th by F-104S MM6802/9-30 and MM6727/9-34. 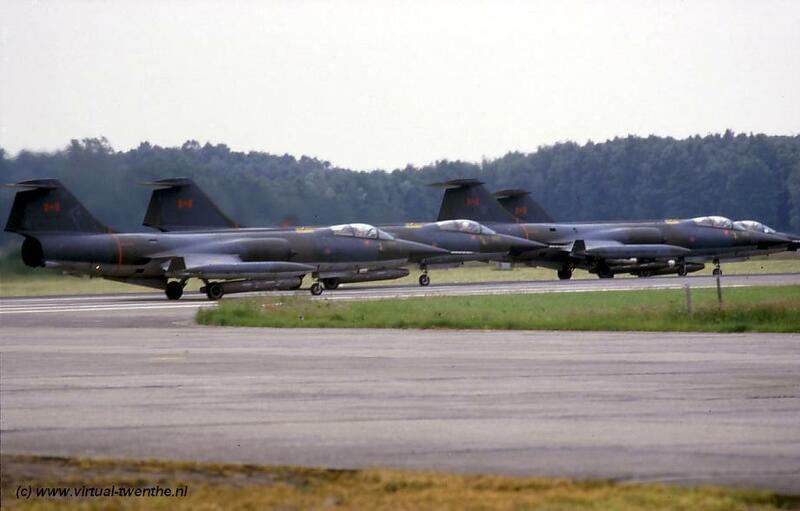 Aircraft during the exchange in Holland were MM6873/9-35, MM6768/9-42, MM6811/9-45, MM6730/9-52. Fokker F-27M Friendships C-7 and C-11 were used for the transport on 29 June 1982 while the Italian performed there return using G-222 aircraft MM62124/46-88 and MM62129/46-29 on 8 July 1982. Photos beneath show 3 of the four aircraft at Eindhoven Air Base. We do not know who photographed these except 9-52 which was taken by Carlo Geurts on July 8th. 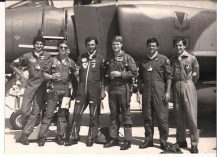 This month Canadian Air Force 421 Squadron, based at Baden-Sollingen, flying the CF-104, had a squadron exchange with a Royal Danish Air Force Squadron based at Karup flying the SAAB Draken. 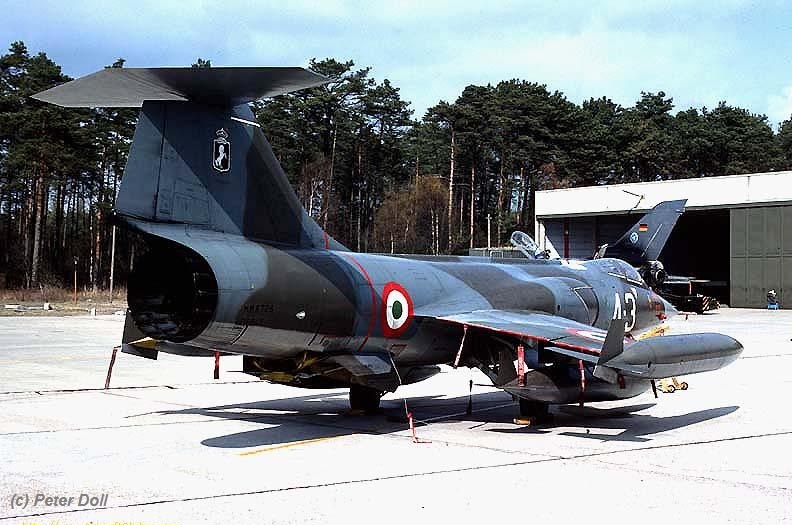 It is unknown if it was a 1 or 2-way exchange but at least fourf CF-104 flew to Denmark being 104756, 104813, 104815 and 104865. 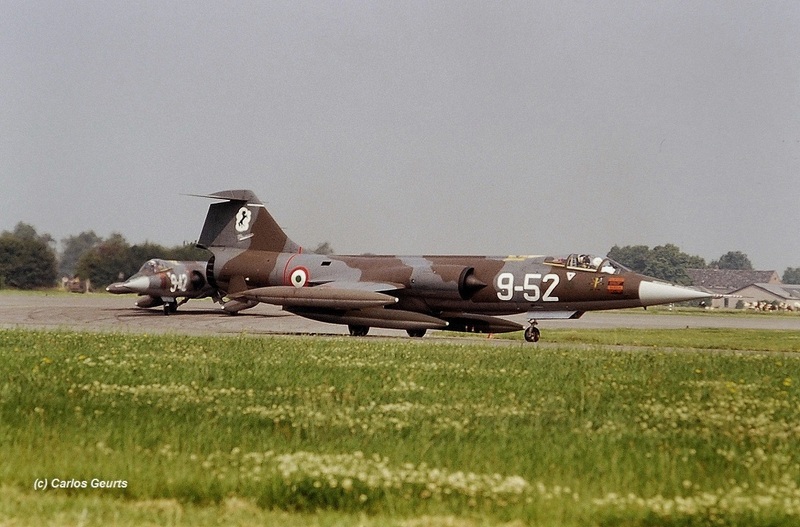 This period a 1-way squadron exchange took place between the Turkish Air Force 191 Filo (9AJU) based at Balikesir AB, flying the F-104G, with the Dutch Air Force 312 Squadron at Volkel AB flying the F-104G. 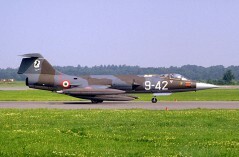 Only the Dutch Starfighters flew to Turkey and it is unknown why the Turkish 104s did not come to Holland. 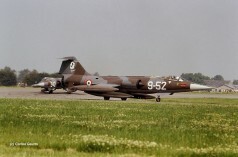 Dutch Starfighters flying from Balikesir AB were D-8061, D-8063, D-8091, D-8259, D-8331 and TF-104G D-5808. For the return the squadron received support from Fokker F-27M Troopships C-9 and C-12 from 334 Squadron which flew back all personnel and equipment to Volkel Air Base on September 2nd. Interesting detail was that the TF-104G D-5814 (ex Leeuwarden AFB) flew with the 312sq aircraft to Turkey as delivery flight to the Turkish Air Force. (Some believe the participating Turkish squadron was 192 Filo, who can confirm this?). 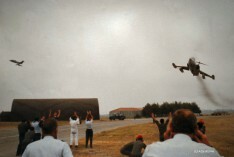 Photos beneath were taken at Balikesir from different angles when two 104s flew very low fare-well pass over the airbase on the day of the departure. 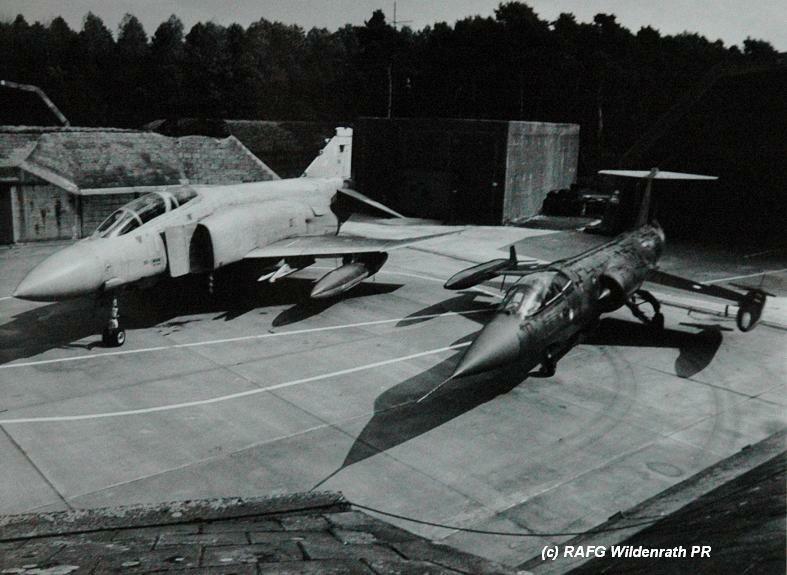 Early September 1982, the Danish Air Force 723 Eskadrille based at Aalborg, flying the F-104, exchanged with RAF 92 Squadron based at Wildenrath AB, flying the Phantom FGR.2. It was a 2 way shifted exchange. 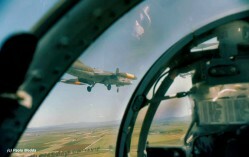 On September 14th a special squadron press report was released. 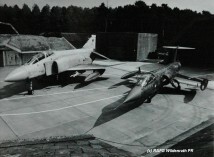 Photo beneath was part of the Wildenrath Air Base press release regarding the squadron exchange (Roger Seroo Collection). 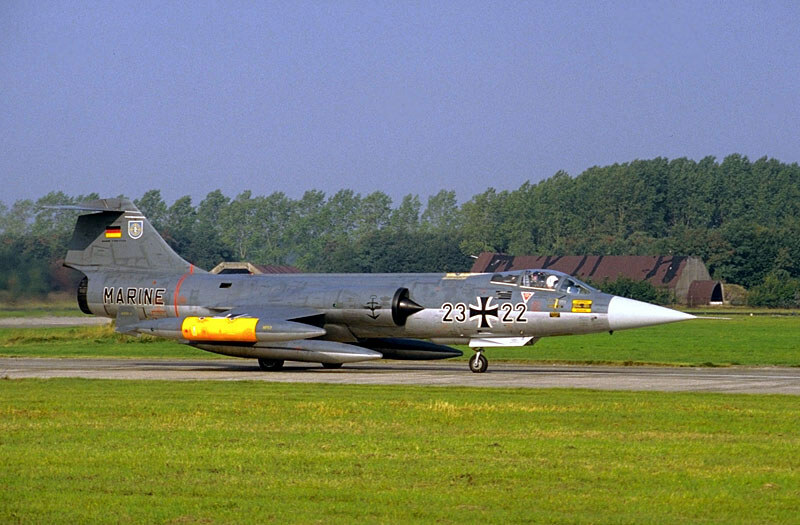 Sadly the serial of the F-104 is unreadable on this photo. 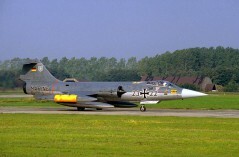 Aircraft seen at Wildenrath were: R-814, R-855, R-888, RT-667. 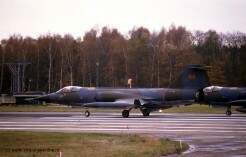 During the exchange some other Starfighter visited Wildenrath being RT-664 on 13 September and RT-664 together with RT-655 stayed the last night from 15 to 16 September. Transport back to Denmark was arranged by C-130H B-680 (721 Esk). It's unknown when the Phantoms flew to Aalborg for their shift. This month Italian AF F-104S Starfighters from 22 Gruppo, based at Istrana, exchanged with 350 Squadron at Beauvechain, flying the F-16A. It is unknown if it was a 1 or 2 way exchange but at least the F-104's were seen at Beauvechain. 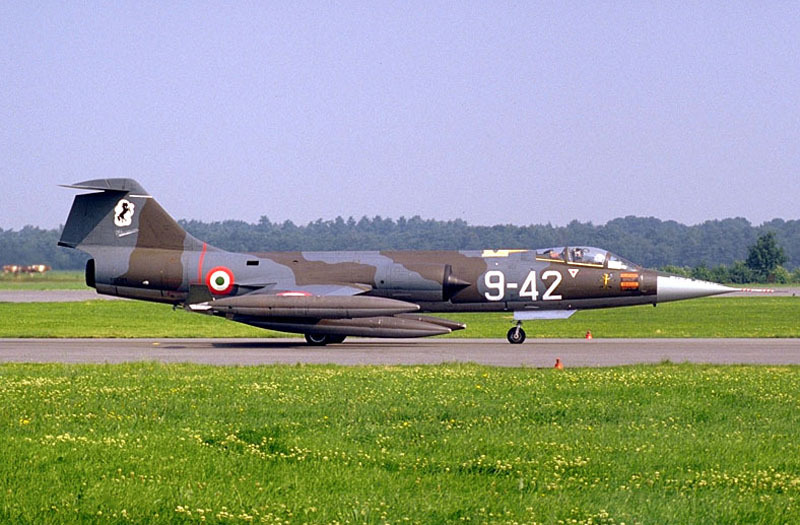 This month four Italian AF Starfighters from 155 Gruppo, based at Istrana, exchanged with 17 Squadron at Bruggen flying the Jaguar GR.1 fighter-bomber. 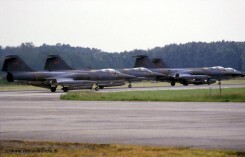 The four Starfighters which arrived on 14 September 1982 were: MM6741/51-34, MM6745/51-37, MM6749/51-41 and MM6847/51-46. It was a two-way exchange. 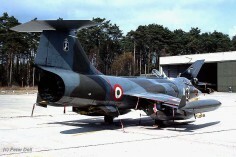 The Italian Starfighter didn't fly often. They started their first missions on September 21st and left again to Italy on the 24th. Support was provided during arrival (14th) by C-130 MM62001/46-15 while by two G-222 aircraft (MM62102/46-20 and MM62120/46-90) provided the transport back to Italy on the 23rd. Beneath a photo taken by Antonio Battan at Istrana during the exhange showing a nice mixed formation. Information thanks to Hans-Jürgen Breuer. 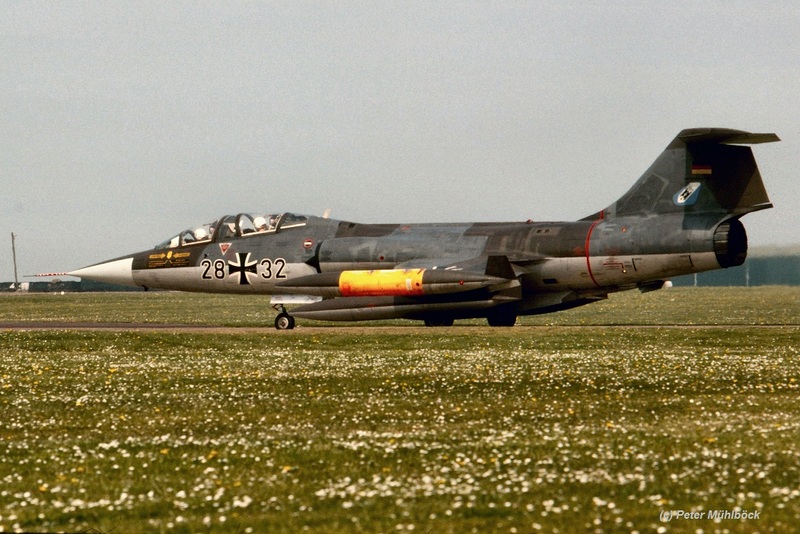 This month Dutch Air Force 306 Squadron, based at Volkel AB, flying the RF-104G, had a squadron exchange with German Navy MFG2 (1st Staffel) based at Eggebek, also operating the RF-104G. It was a 2 way exchange. 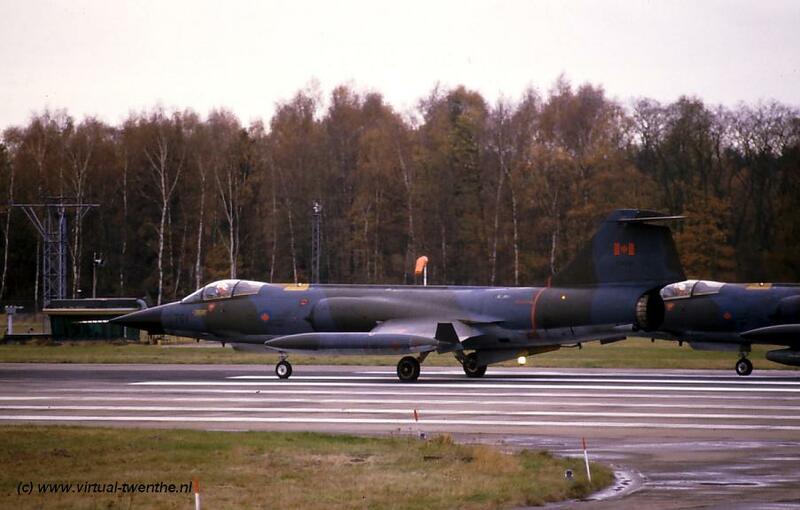 Four Dutch RF-104G aircraft flew to Germany, being D-8105, D-8107, D-8143, D-8311 and one TF-104G D-5804 and four German RF-104G flew to Holland being 21+22, 21+25, 21+29, 23+22. The Dutch Starfighters in Eggebek received yellow navy anchors zapped on the intakes just behind the Dutch roundels. Pre exchange was on August 10th with two Starfighters 21+17 and 26+57. 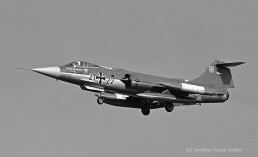 The photo beneath shows RF-104G 21+22 landing at Volkel on September 23rd. 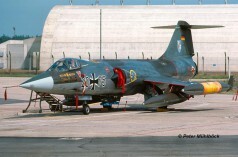 When looking carefully you will notice an other Marine Starfighter just behind this aircraft. (Thanks to the Spotting Group Volkel). 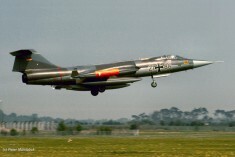 This period Royal Air Force 12 Squadron, based at Lossiemouth and flying the Buccaneer S.2B, had a 1-way Squadron exchange with a German Navy MFG2 staffel based at Eggebek, flying the F-104G. In total six Starfighters flew to the UK. 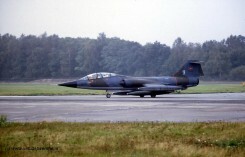 This month Canadian Air Force 439 Squadron, based at Baden-Sollingen, flying the CF-104, had a squadron exchange with Dutch Air Force 315 Squadron, flying the NF-5, based at Twenthe AB, flying the NF-5. 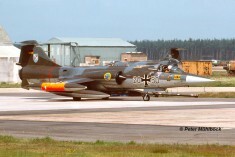 It was a 2-way shifted exchange where first five Dutch NF-5 aircraft flew to Baden on June 7th to stay for ten days. Later that year, on the 4th of October, CF-104's 104735, 104770, 104788, 104839, 104868, 104873 and CF-104D 104661 arrived at Twenthe for the Canadian part of the exchange. 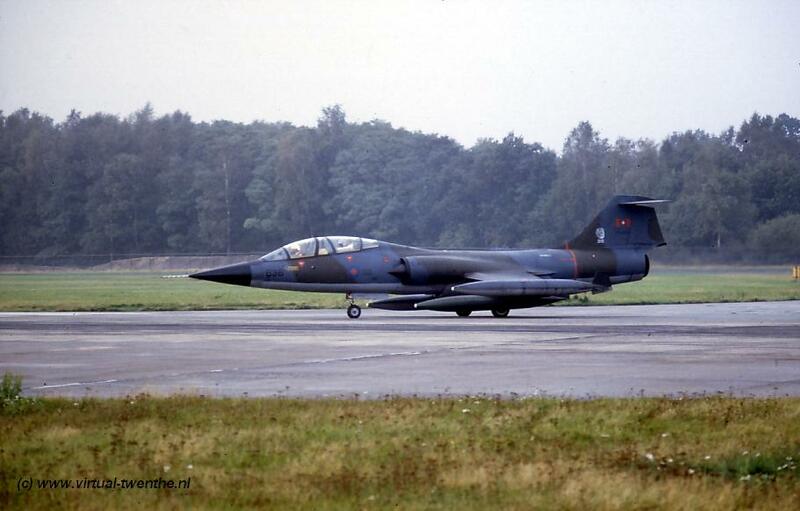 On the 8th of October also CF-104D 104636 arrived as 8th aircraft. It is likely that aircraft 104761 flew to Twenthe AB during a pre-exchange on an unknown date. 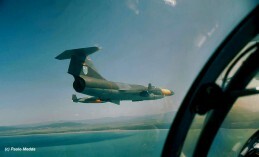 Overall the CF-104s flew 89 missions (99.5 hours). Photos beneath show (from left to right) 104761 with another CF-104 at Twenthe Air Base during the pre-exchange, 104636 moving to the runway. Note the 315 squadron zapp on its tail. Finally a photo showing the four participating CF-104s.